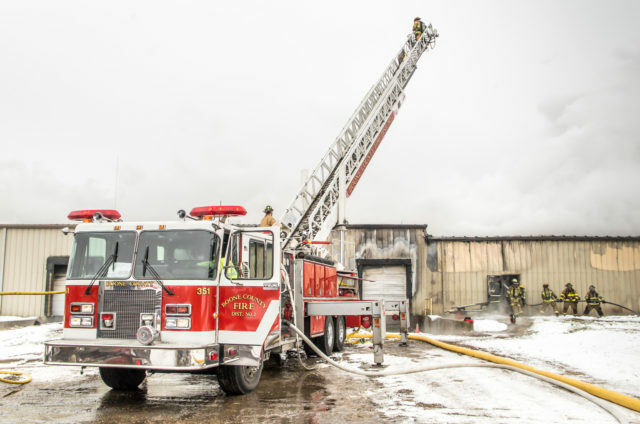 Boone County Fire District 2 fought the fire at Superior Coatings from both the ground and from the top of their ladder truck. Road. The occupants of the building had just self-evacuated prior to arrival of fire units from Boone County. Heavy smoke and fire conditions were encountered early on and spread rapidly throughout the factory of approximately 40,000 square feet. Mutual aid was called early on, assistance was provided by all public safety agencies in Boone County in support of the 27 firefighters from Boone County Fire District Two on scene. 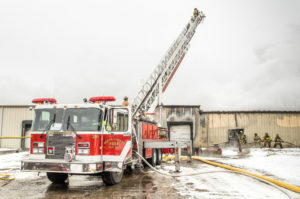 Fire Departments from Winnebago, McHenry, DeKalb, and Rock Counties for a total of sixteen fire, EMS, and law enforcements agencies also responded. Fire crews were on scene for more than seven hours with no firefighter or civilian injuries reported. For complete article, pick up the Jan. 24 Belvidere Republican.